The shared thoughts and artwork of Beverly Hinckley. Beverly is a visiting artist from Wakefield, MA. Her work will be on exhibit at the Melrose Arts Festival from April 26-28, 2013. Art means a freedom of expression from the soul. It allows me to respond to my emotions, events I am involved in, or sights I have witnessed in an expressive and non-regular way. I can play with color, fabric, texture and form to my heart’s content. Inspiration is all around me and everything stays fluid! Q. 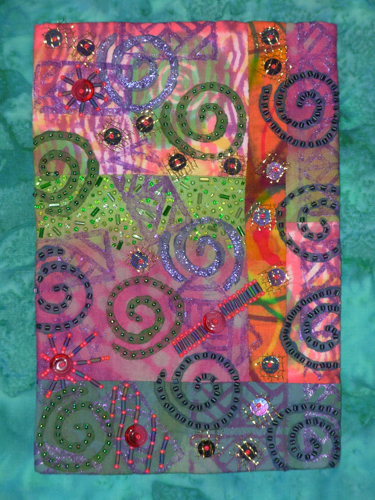 How long have you been creating textile designs through quilting for? Did someone specifically teach you? 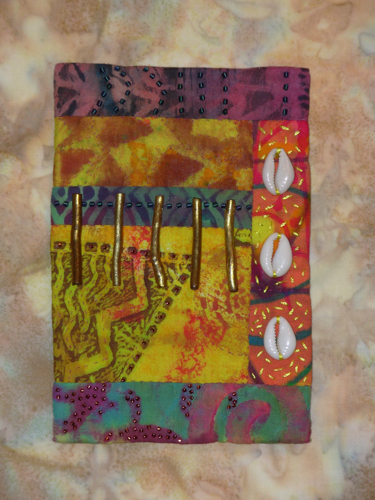 I have been creating textile designs that sometimes utilize found objects since I was a child. I always collected bits of nature at my summer home in Canada such as wood with appealing form, shells, fish bones, leaves and flower; or pieces of fabric or metal that had wonderful color and texture – to create collage. About 10 years ago I got into traditional quilting – but it was never free enough and far too repetitive – so I began to work in free-form design – clothes, art pieces, purses. Q. What inspires your designs? 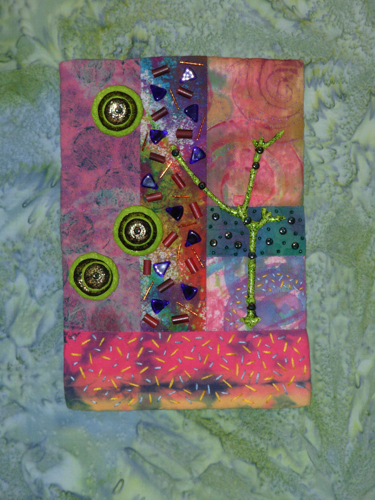 I get a lot of inspiration from my friends and family, and my dear quilting group, and recently the other artists of the new Mystic Art Gallery in Medford. I’m learning a lot from them. I am also influenced by the Impressionists and Ethnic forms. I recently moved to Wakefield near the lake and the many shapes and colors of water are inspirational. My garden is always an inspiration. It is beautiful in summer or winter and the constant changing landscapes are fabulous. I remember one morning it was frigid, but it had rained the night before. Just as the sun rose over the garden, the light was refracted into a million tiny rainbows. Inspiration!! Q. What influences the fabrics and colors chosen in your quilt designs? I have no formal art training, so my theory of color is simple: if I put any to colors together and they don’t make my stomach quiver – they work! Much of my work is simply playing with color, shape and layering. I do the same thing in my garden – I am constantly moving plants to create landscapes within the landscape so everywhere one looks there is a beautiful “scene”. 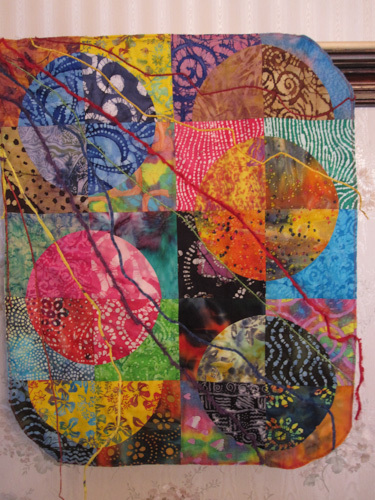 I go to all the quilt shoes and museums to see what inspires other artists, collect photos and rip pictures and bits of astounding color from magazines or catalogs. Many times I sit and look through my collection to put ideas together in new ways. Q. What is your creative process? 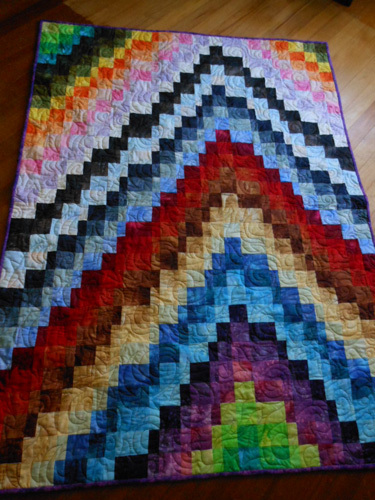 How long does each quilt take to complete? My creative process varies with my idea. I think: I wonder how those forms would look together, and then I start pulling fabrics out of my myriad piles. 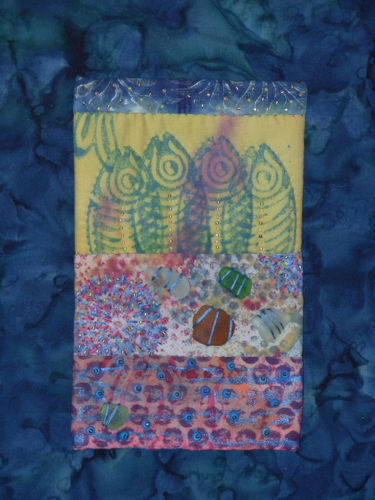 I use a lot of hand painted batik fabric which includes beautiful shapes and designs that I incorporate into my layouts. I will put something together and then walk away for a couple of days – often to return and move everything around. I use my grandmother’s lace and crocheted pieces, buttons, bits of interesting metal and beads – really anything with an appealing shape or texture. Q. How do you relate to your artwork? Is it a reflection of your personality or mood when creating one? 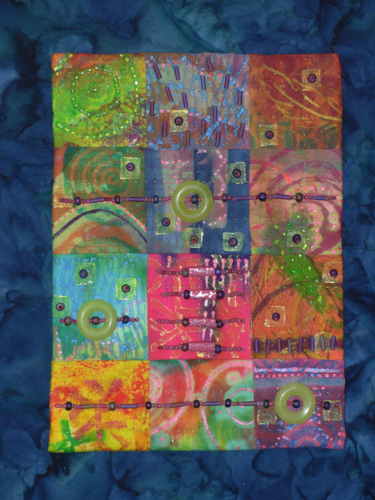 I think textile is my unique art form in that it incorporates texture and minute variations of color or pattern that are natural in fabric. “Painting” with fabric is less stressful for me! But I recently discovered what I innately knew; that my work evolves with my mood. Many times I go back to a piece that didn’t please me and revisit the idea. A whole new piece evolves with my state of mind. I have been doing art shows for over 10 years – I started in Canada – and over time got the confidence to apply for shows around here. 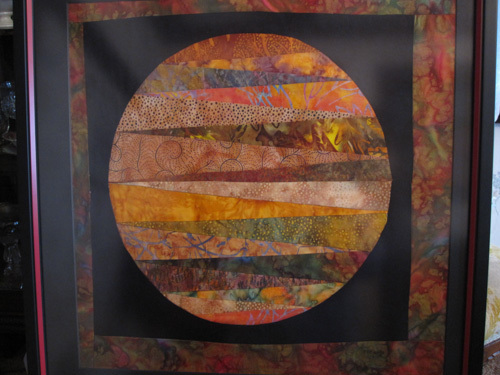 I do a lot of commission quilting – both regular patterns and those I create myself. As I explore and create, I continue to learn how much is truly possible. The whole process feeds my soul! The shared thoughts and artwork of Penelope Young. Penelope is a local artist from Melrose, MA. Her work will be on exhibit at the Melrose Arts Festival from April 26-28, 2013. Q. How long have you been sewing? Who taught you? I have been sewing since I was twelve. I have always loved fabric. Before I learned to sew, I used to make Barbie clothes out of my mom’s left over fabric from her sewing projects. It was always just cutting the fabric and wrapping it around the dolls. I took Home Economics in middle school and that was the best. I loved it. Q. What influences the colors and patterns you decide to use? I am influenced by the world around me. The shared thoughts and artwork of Sue Colozzi. Sue is a visiting artist from Reading, MA. Her work will be on exhibit at the Melrose Arts Festival from April 26-28, 2013. Q. Who taught you how to sew? I’ve always loved fabrics. After first learning to sew in a junior high school home economics class, my mom saw how much I enjoyed sewing and signed me up for additional lessons at the local Singer sewing machine shop nearby. I knew I wanted to integrate my interest in art and textiles, so in college I earned a BFA in weaving. In one of my design classes I made a three dimensional quilt. It had square patches representing grass and a river, and when you opened it, houses, trees, flowers, and bridges stuffed with foam rubber “popped up” on top of the squares. That project really made me start thinking beyond the commercial patterns I had grown up with! Since then I’ve either had jobs that involved sewing or as an educator, often incorporated sewing and textiles into my classroom. Q. 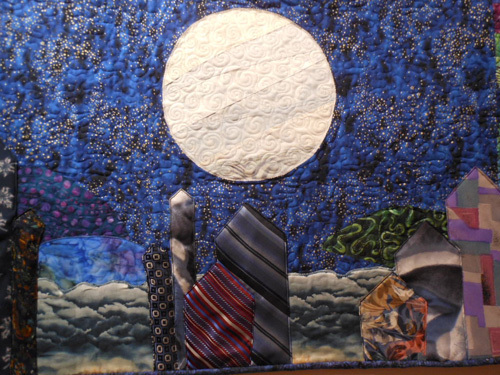 What inspires the images that you choose to capture on the quilts? I’m originally from Milwaukee. When I first came to Boston in the 70s to visit a friend I knew this area would become my home. I loved Boston’s brownstones and different neighborhoods. I loved being near the ocean. 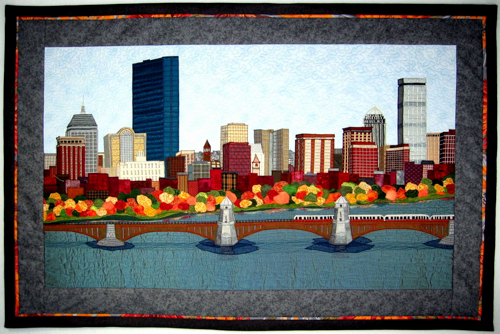 When I started quilting, I chose my favorite places in Boston – the Public Garden, Haymarket, and most important to me – the skyline of Back Bay. Every time I took the Red Line to Cambridge I made sure I sat on the side of the train that would allow me to look across the river and see that view. 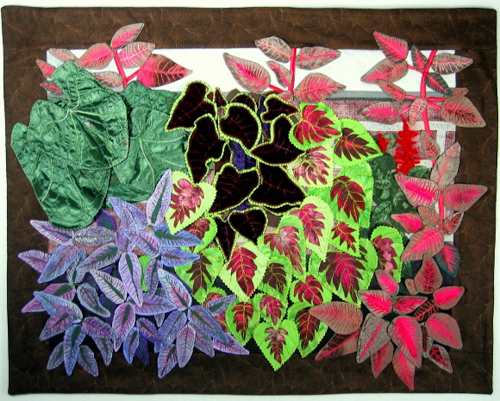 In addition, I’ve spent many vacations in Provincetown, and while walking through the town I have been easily inspired by unusual and colorful gardens, like the ones I portrayed in Provincetown Garden and Commercial Street Coleus. Q. How large are the quilts typically and is commissioned/custom quilts available? 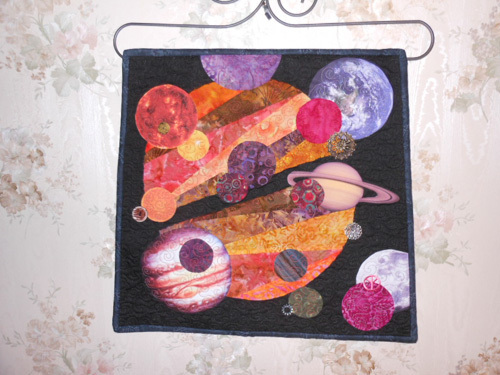 My quilts range in size from 12” square to 43” x 29”, with most being in the middle of those two sizes. I choose subjects that particularly interest me and have not yet completed any commissioned work. Q. What is your creative process? How long does one take to complete? When I come upon a site I like, I take several photographs of it and sometimes find additional views online. I draw a rough sketch of my scene, combining the different photographic views into one portrait that contains the important elements I want to illustrate. I strive to portray the scene as realistically as possible, finding fabrics and threads that mimic the actual subjects and accurately convey what I see. 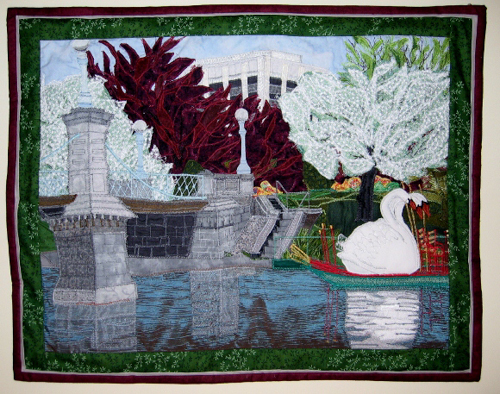 In making the quilts, I start with the scene background, and layer by layer build the foreground. I use fusible webbing to initially attach each fabric piece to my background and then later add stitched borders and details. 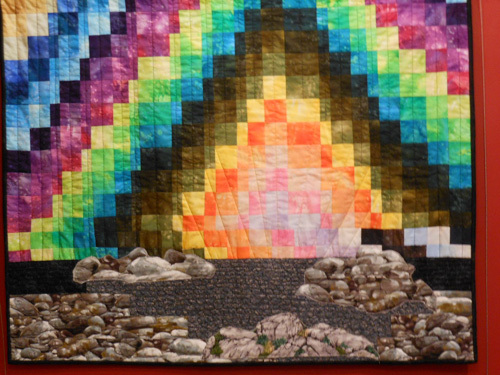 The quilts average around 40 hours of design and sewing time, with even the small quilts taking up to 20 hours to make. Q. What influences the specific fabrics and patterns used to interpret the landscape/scenery? I enjoy looking for the “perfect” fabric to represent a building, flower, leaf, or even vegetable! Texture, color, luster, transparency – they’re all important qualities that contribute to just the “right” fabric choice. 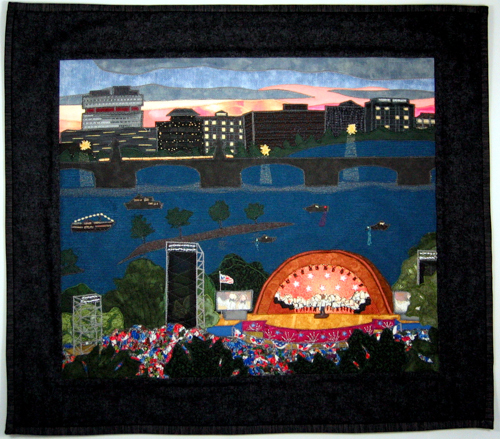 In both of my Boston Skyline quilts, I found a fantastic fabric to illustrate the Prudential Center! It was a pale blue chiffon with silver and white threads creating grid lines. The Prudential Tower has several floors that are darker in color than the rest of the building, so I placed narrow strips of gray fabric behind the chiffon to provide the change in shading. In making Boston Public Garden in Springtime, I first tried making the tree blossoms using floral stitches on my machine, but they just didn’t create the effect I wanted. Wandering through a fabric store I saw a bridal lace that looked exactly like the blossoms – it was so exciting! So far I’ve been using commercial fabrics, but I want to try painting fabrics to achieve the exact color and shading I see in my subjects. Q. You noted that you started creating these pieces only three years ago. What inspired you? I taught fifth grade until three years ago. Teaching left me little time to spend on my art, so once I retired I’ve been able to devote as much time as I want to creating quilts. 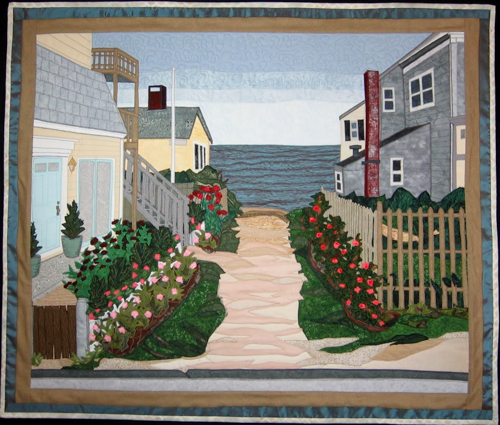 Many years ago it was common to find small quilts in oversized embroidery hoops depicting a scene. I’ve wanted to play with that concept for a long time but not be restricted by a hoop. Q. How has your art developed who you are as an individual? I can teach a child how to sew, but art helps me take that child’s idea and create our own pattern and directions to make that child’s idea. I can visualize what I would like a costume to look like, but art allows me to use my skills to create that costume as I pictured it. 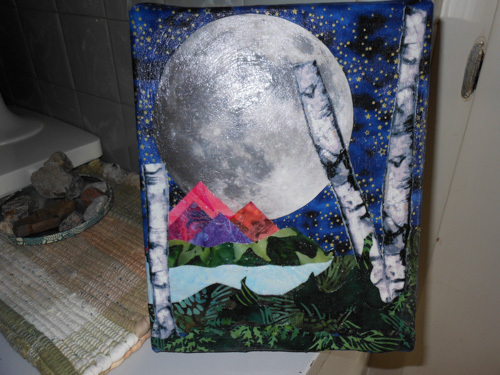 I can admire a pretty view, but art enables me to make it my own out of fabric and thread. Art gives me the confidence to personalize what I see and create what I imagine. Q. What advice would you give to other emerging artist? It’s so important to find other people who are supportive of your work. Try to find local organizations that will help you connect to other artists. I was sewing on my own until I joined a local quilting guild. There I met people who understood what I was doing and referred me to other organizations (like Melrose Arts). Other artists can give you feedback and encouragement as your work goes through natural transitions. 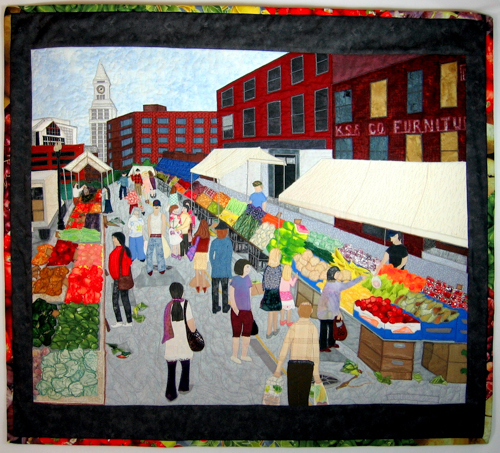 The Melrose Arts Festival will be my first chance to try to sell my quilts. I’m thrilled to be a part of the Festival!